Keeping your business up and running, while trying to organise a swift, and affordable office relocation is a real test of managerial skills. If you are looking for a better, more efficient way to move your place of business to another location then perhaps you should look for specialised office removals in Beckenham. We can offer you an affordable and highly efficient alternative to organising the removal on your own and that is to use our professional grade office removal service, which covers all stages of the relocation from start to end. We understand that the relocation must be completed within the shortest time possible and with minimum disruption to your daily business and staff duties. Due to this, we work with professional mover teams who have the necessary skills and expertise to handle all stages of the removal process with professional pace and efficiency. Working with seasoned professionals cancels out the margin for error and ensures safe handling of expensive equipment and office furniture. Our mover teams will deal with sorting, packing and labelling of items to be moved so you don’t have to. In some instances, it might be necessary to disassemble certain pieces of furniture or equipment, in order to ensure efficient, risk-free transportation. Our movers have the necessary training to disassemble and then put back together such items without losing parts or causing damage. We can also provide you with a number of additional services at very reasonable prices. These include single item office removals for things like filing cabinets, large pieces of electronic equipment or other standalone office features like water coolers, professional photocopiers, servers etc. In many instances, customers need to store some or all office contents for the time being, for such occasions we can assist you with cost effective, specialised storage services that will keep your office contents safe and secured in weatherproof storage facilities. When looking for the best office removals in Beckenham makes your top choice as our services are moderately priced and widely accessible by all businesses. We will provide you with free and fair, individually prepared service quotes. Our affordable office removals in Beckenham BR3, SE20 were developed to leave the minimal possible footprint on the environment. As a start, we from Removal 24 have a collection of fuel-efficient moving trucks and vans which are kept in a picture-perfect condition. Depending on the scale of your relocation, we will pick an advanced transit vehicle that is neither too small nor too large for the job. Also, we can lend you a vetted and licensed hand that will help you pack your personal possessions with recyclable packing supplies. Our green office removal services in BR3, SE20 Beckenham are surprisingly pocket-friendly. 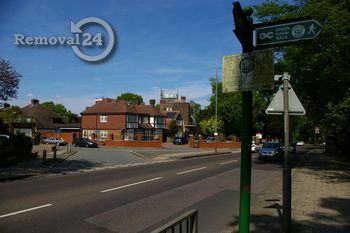 Beckenham is sitting in the London Borough of Bromley and it is about 8.4 miles from Charing Cross. The district is inhabited by more than 56,000 people. St George’s Church which was originally constructed in 1100 is one of the most famous local attractions and it is a Grade II listed building.